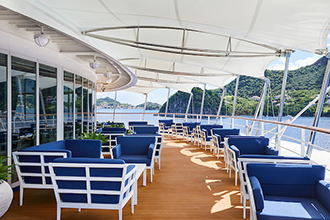 The beautiful 382-guest Silver Whisper provides the ultimate vacation experience. 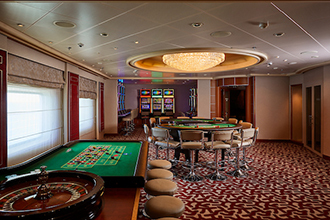 Your luxurious home away from home offers exceptional pampering on this spectacular sister ship to the Silver Shadow. 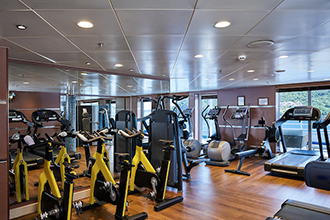 The freedom of the all-inclusive lifestyle is evident as you enjoy a convivial cosmopolitan ambiance and special amenities, such as lovely boutique shops, a wellness spa and beauty salon, state-of-the-art fitness center and sauna, fabulous full-scale productions in the multi-tiered Show Lounge, an Internet Café and WiFi service throughout the ship. 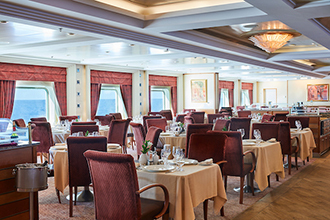 Impeccable service and delicious cuisine are hallmarks as you cruise in glorious style and comfort to exciting ports. Luxuriate on the Silver Whisper, where carefree timeless days let you unwind at the pool, pamper yourself with a rejuvenating massage at The Spa and take a yoga class in the state-of-the-art Fitness Center. Afternoon Tea and the pianist in the Panorama Lounge are a highlight in the afternoon. 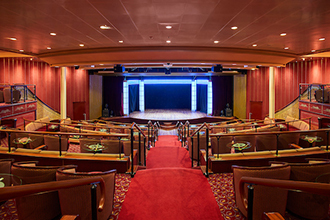 Fascinating port talks and enrichment lectures are featured throughout your cruise. 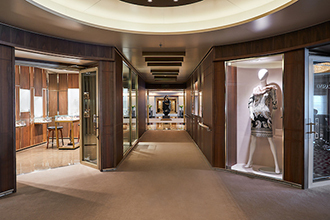 Shop at the Boutiques where you can indulge in designer collections and various duty-free items. 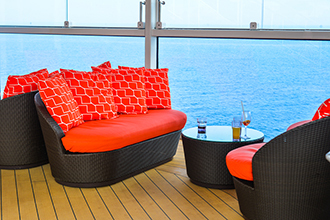 Sip a cocktail at the Pool Bar and enjoy healthy CruiseLite fare. Memorable nights may include cocktails and canapés in a romantic bar, a film and a fabulous show. 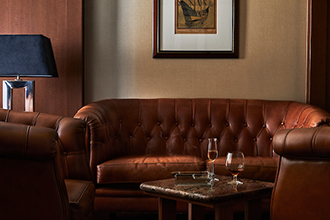 Play blackjack and other games at the elegant Casino and enjoy exceptional cognacs with friends in the Connoisseur's Corner and in the Observation Lounge. Mix and mingle at The Bar, boasting complimentary cocktails, live music, a dance floor and an engaging atmosphere. From a glamorous supper club to concert-style productions, nightlife is varied and exceptional. Acclaimed for innovative cuisine savor delectable Slow Food-style dishes at La Terrazza, a traditional Italian restaurant. 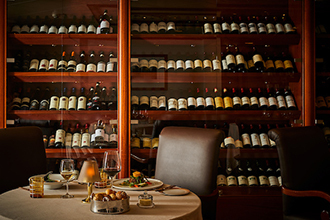 Highlighting all menus are sommeliers' selections of some of the world's most celebrated vintages, ideal for aficionados. 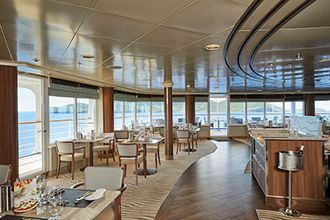 Wine connoisseurs will relish Le Champagen, the only Wine Restaurant by Relais & Châteaux at sea which is solely offered on Silversea vessels. Savor fine cuisine from an incredible tasting menu, complemented by fine wines, as you experience an amazing six-course dinner. Delicious culinary delights are served at The Restaurant, the main dining room, where you will dine with the elegance of sparkling silver, crystal and romantic candlelight. Highlights include international dishes and regional specialties. The Pool Bar & Grill is the perfect spot to enjoy lite fare for breakfast and lunch along with your sunshine and balmy breezes. In the evenings the Pool Grill morphs into The Grill with its dynamic Black Rock Grill experience. Hot volcanic rock is brought to your white linen clad table along with your choices of prawns, steak, salmon and more to be cooked as you wish. Unwind in the ultra-luxury ambiance of some of the most well-appointed suites at sea, and all with the attentive services of a butler. 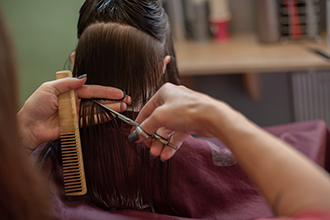 Additionally, all suites boast a refrigerator and bar stocked with your preferences, high-end bath amenities, full marble baths, premium mattresses and pillow menu, luxurious Pratesi® linens, WiFi and much more. 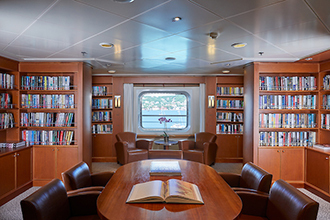 Comfort and elegance, reminiscent of a grand hotel, awaits you on the spectacular Silver Whisper. Cruise on the Silver Whisper to worldwide destinations including Caribbean, Panama Canal, Mediterranean, Northern Europe, U.S. & Canada, Australia/New Zealand, Transcanal/Panama Canal, South America, Hawaii/South Pacific and Transatlantic & Repositioning voyages. 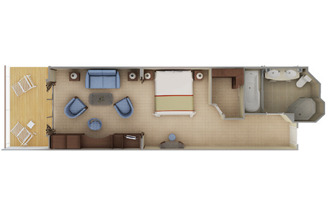 345 sq.ft. including veranda 60 sq.ft. • Teak veranda with patio furniture and floor-to-ceiling glass doors • Sitting area • Twin beds or queen-sized bed • Marbled bathroom with double vanity, full-sized bath, separate shower • Walk-in wardrobe with personal safe • Vanity table with hair dryer • Writing desk • Flat screen television with DVD and satellite reception. 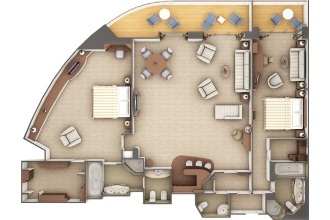 941–1,090 sq.ft. including veranda 103–116 sq.ft. •Large teak veranda with patio furniture and floor-to-ceiling glass doors •Living room with sitting area •Separate dining area and bar •Twin beds or queen-sized bed •Marbled bathroom with double vanity, separate shower and full-sized whirlpool tub, plus a powder room •Walk-in wardrobe(s) with personal safe •Vanity table(s) with hair dryer •Writing desk(s) •Flat screen television(s) with DVD and satellite reception •Bang & Olufsen audio system •Illy Espresso machine. 1,286-1,435 sq.ft. including veranda 163–176 sq.ft. • Large teak veranda with patio furniture and floor-to-ceiling glass doors; two-bedroom has additional veranda • Living room with sitting area; two-bedroom has additional sitting area • Separate dining area and bar • Twin beds or queen-sized bed; two-bedroom has additional twin beds or queen-sized bed • Marbled bathroom with double vanity, separate shower and full-sized whirlpool tub, plus a powder room; two-bedroom has additional marbled bathroom with full-sized bath • Walk-in wardrobe(s) with personal safe • Vanity table(s) with hair dryer • Writing desk(s) • Flat screen television(s) with DVD and satellite reception • Bang & Olufsen audio system • Illy Espresso machine. 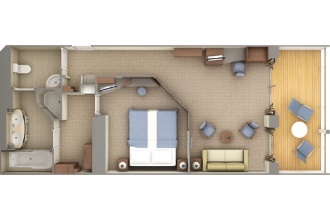 521 sq.ft. including veranda 81 sq.ft. • Teak veranda with patio furniture and floor-to-ceiling glass doors • Living room with sitting and dining area • Twin beds or queen-sized bed • Marbled bathroom with double vanity, separate shower and full-sized whirlpool tub • Walk-in wardrobe with personal safe • Vanity table with hair dryer • Writing desk • Flat screen television with DVD and satellite reception. 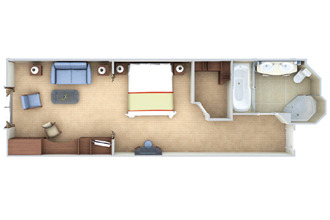 919 sq.ft. including veranda 220 sq.ft. •Large teak veranda with patio furniture and floor-to-ceiling glass doors • Living room with sitting area • Separate dining area and bar •Twin beds or queen-sized bed •Marbled bathroom with double vanity, separate shower and full-sized whirlpool tub, plus a powder room • Walk-in wardrobe(s) with personal safe •Vanity table(s) with hair dryer •Writing desk(s) •Flat screen television(s) with DVD and satellite reception •Bang & Olufsen audio system •Illy Espresso machine. 1,264 sq.ft. including veranda 220 sq.ft. •Large teak veranda with patio furniture and floor-to-ceiling glass doors; two-bedroom has additional large picture window • Living room with sitting area; two-bedroom has additional sitting area •Separate dining area and bar •Twin beds or queen-sized bed; two-bedroom has additional twin beds or queen-sized bed •Marbled bathroom with double vanity, separate shower and full-sized whirlpool tub, plus a powder room; two-bedroom has additional marbled bathroom with full-sized bath •Walk-in wardrobe(s) with personal safe • Vanity table(s) with hair dryer • Writing desk(s) • Flat screen television(s) with DVD and satellite reception •Bang & Olufsen audio system •Illy Espresso machine. 967–1,007 sq.ft. including veranda 110–116 sq.ft. •Large teak veranda with patio furniture and floor-to-ceiling glass doors •Living room with sitting area •Separate dining area and bar •Twin beds or queen-sized bed •Marbled bathroom with double vanity, separate shower and full-sized whirlpool tub, plus a powder room •Walk-in wardrobe(s) with personal safe •Vanity table(s) with hair dryer •Writing desk(s) •Flat screen television(s) with DVD and satellite reception •Bang & Olufsen audio system •Illy Espresso machine. 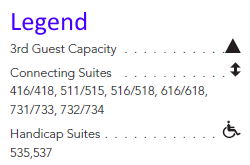 1,312–1,352 sq.ft. including veranda 170–176 sq.ft. • Large teak veranda with patio furniture and floor-to-ceiling glass doors; two-bedroom has additional veranda • Living room with sitting area; two-bedroom has additional sitting area • Separate dining area and bar • Twin beds or queen-sized bed; two-bedroom has additional twin beds or queen-sized bed • Marbled bathroom with double vanity, separate shower and full-sized whirlpool tub, plus a powder room; two-bedroom has additional marbled bathroom with full-sized bath • Walk-in wardrobe(s) with personal safe • Vanity table(s) with hair dryer • Writing desk(s) • Flat screen television(s) with DVD and satellite reception • Bang & Olufsen audio system • Illy Espresso machine. 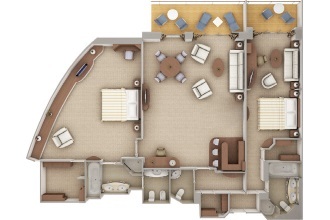 653–701 sq.ft. 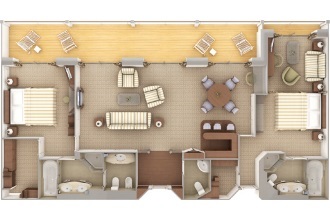 including veranda 110–123 sq.ft. • Teak veranda with patio furniture and floor-to-ceiling glass doors • Living room (with convertible sofa to accommodate an additional guest) • Sitting area • Separate dining area • Twin beds or queen-sized bed • Marbled bathroom with double vanity, separate shower and full-sized whirlpool tub • Walk-in wardrobe with personal safe • Vanity table with hair dryer • Writing desk • Flat screen television(s) with DVD and satellite reception • Bang & Olufsen audio system. 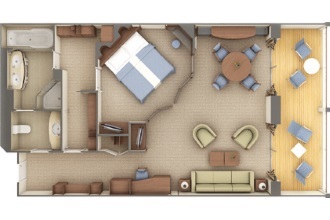 287 sq.ft. • Large picture window providing panoramic ocean views • Sitting area • Twin beds or queen-sized bed • Marbled bathroom with double vanity, full-sized bath, separate shower • Walk-in wardrobe with personal safe • Vanity table with hair dryer • Writing desk • Flat screen television with DVD and satellite reception. A divine selection of Italy’s best cuisine is served à la carte in La Terrazza. Authentic recipes and the freshest ingredients come together with flair and passion – a flavourful expression of Silversea’s distinctive Italian heritage that embraces the principals of the Slow Food movement.La Terrazza uses buffalo mozzarella from Naples, organic balsamic vinegar and olive oil from Umbria, and air-dried ham out of Parma. The Emilia-Romagna region also produces Silversea’s 24-month aged Parmigiano Reggiano, while the pasta is made daily right on board. Sparkling with silver, crystal and candlelight, this luxury cruise ship’s main dining room serves contemporary, international cuisine with sophisticated elegance and impeccable service. Menus feature regional specialities unique to the voyage destination, for example, Roasted Chilean Sea Bass while cruising the Chilean fjords and Indian Chicken Korma en route to Mumbai. During days cruising on the Silver Whisper, choose something from La Collection du Monde, a series of signature dishes created exclusively for Silversea by the Grands Chefs Relais & Châteaux. With complimentary cocktails and engaging conversation, live music and a dance floor, The Bar welcomes guests to mix and mingle. 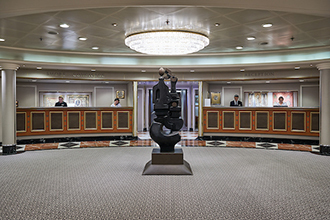 The Panorama Lounge is specially designed to provide an uninterrupted view of the day’s destination from the comfort of the ship’s interior. This is an ideal place to unwind, enjoy afternoon tea, listen to the pianist and watch the setting sun. Every seat in this multi-tiered venue enjoys a clear view to the stage. Applaud a broad spectrum of entertainment — from full-scale production shows and classical soloists, to cultural entertainment and feature films.